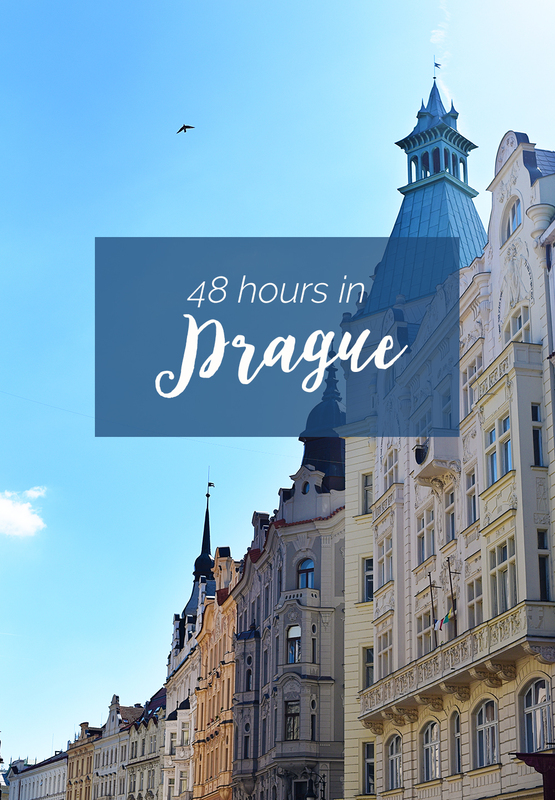 The Best of Prague in 48 Hours - Real life, on purpose. 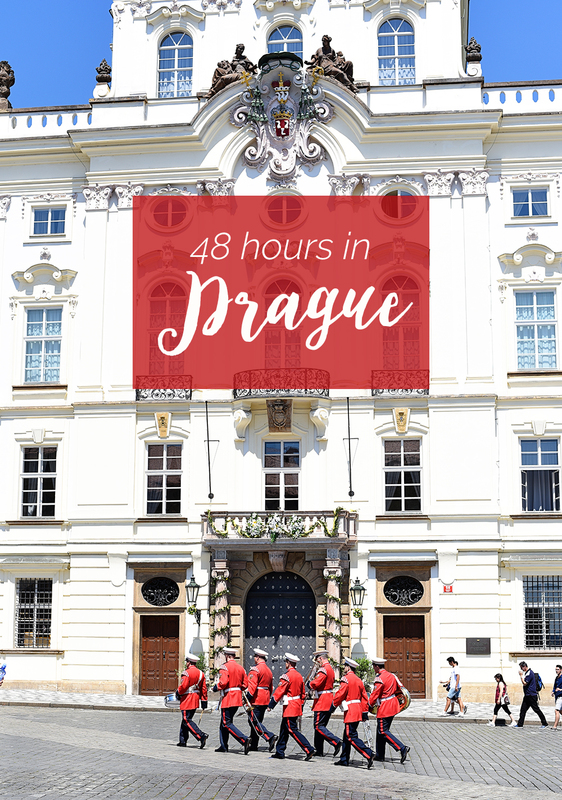 When we visited Prague, we only had 48 hours to see ALL THE THINGS. Let me tell you right now, that is not enough time. A week in Prague might do it justice. Maybe. But since we were on a tight schedule (one of the negative parts of tagging along on a work trip) we were determined to pack as much into those two days as possible. This is a super detailed travelogue of those 48 hours, with maps + photos + recommendations. Our flight got in Saturday evening. Since the sun is up until like 9:30 in the summer, we had a few daylight hours to walk along the river and orient ourselves a bit. David found us the most random—and awesome!—place for dinner: a tiny burger + hot dog joint that was also a butcher shop. Literally it was the size of my family room, with a handful of employees grilling up sausages behind the counter, the butcher holding up meat for customers to smell how fresh it was, and a line clear out into the street. Oh, and two beverages on tap: water and beer. At one point the butcher took the empty beer keg off to who-knows-where and returned hefting a full one on his shoulder. Classic Czech Republic. They’d run out of cheese by the time we got there, so we could only have one cheeseburger and one plain. Ah well. They were still tasty. And the sausages were excellent. Could’ve done without the German frat boys debating who knows what over their beef tartare, but whatever. It was part of the atmosphere. Restaurant Info: Naše maso is located HERE. Plan on a long wait to order and/or get your food. It’s also pretty likely you’ll have to eat standing up. Worth the experience, though! Hotel Info: Hilton Prague is located HERE. It was a little farther from “downtown” than I would’ve liked, but still fairly close to public transit, right on the river, and quite comfortable. The breakfast buffet was excellent, and while pricier than what we could’ve found elsewhere, it was worth the convenience. Sunday—our first full day—found us a little bit jet lagged but ready to roll. Unfortunately, we were not well-prepared with a decent map or any sense of how to use the public transit system. So we walked. A lot. On cobblestones. I wound up with some lovely blisters because we kept getting lost. Travel Tip: Study public transit options in advance. Learn which lines to take and where to get off. Keep screenshots on your phone or find a paper map to carry so you can reorient yourself as needed. 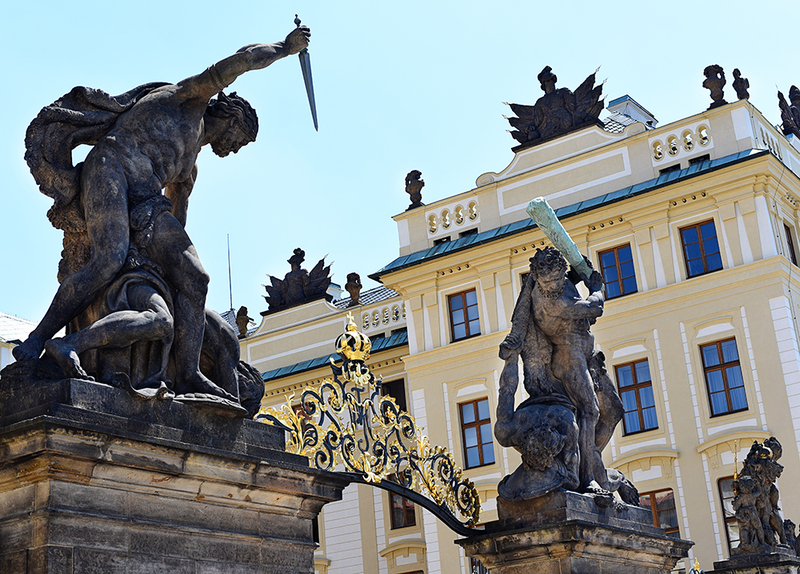 This is totally common sense but I completely failed at it…and it’s probably my only regret from Prague. Once we figured it out, though, it was amazing. The tram lines are especially easy to use once you know where you’re trying to go. First we headed to the Jewish Quarter. The two things I wanted to see were the Spanish Synagogue and the old Jewish cemetery. You need tickets to see both, so we got the cheapest combo ticket that included those two things. We could’ve also gone to a few other places on that ticket, but I was so overwhelmed by the places we did go that I’m not sure I could’ve done any more. At least not that day. 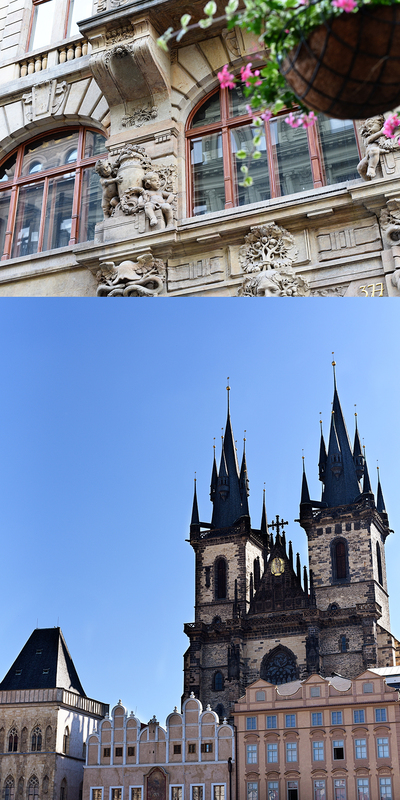 In all our disoriented wandering, though, we wound up in Old Town Square shortly before the top of the hour. 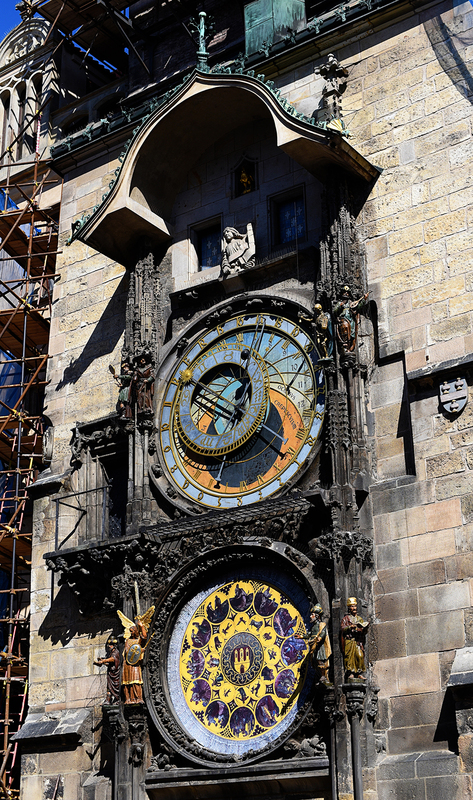 That was convenient, as we were able to watch the famous Astronomical Clock chime. The skeleton statue pulling the bell rope was pretty cool, but otherwise it was underwhelming. And crowded. That place is tourist central. We wandered the Square a bit and took some pictures before making our way to the Synagogue. And let me tell you, that building is breathtaking. 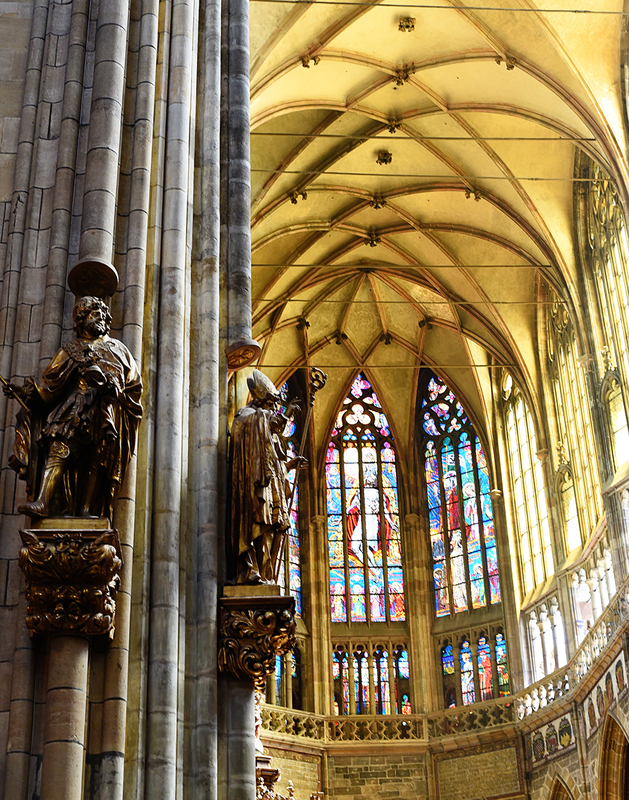 Definitely at the top of my list of things you should see in Prague. Next we walked over to Pinkas Synagogue, adjacent to the cemetery, which surprised me by being a Holocaust memorial. It was beautiful in its simplicity and powerful in its message; the walls are inscribed with the names of those who were killed, including birth and death dates. Row upon row upon row of names. After trying to absorb the reality of so much loss, we walked quietly through the cemetery. It was surprisingly big, yet still so crowded with both graves and tourists. 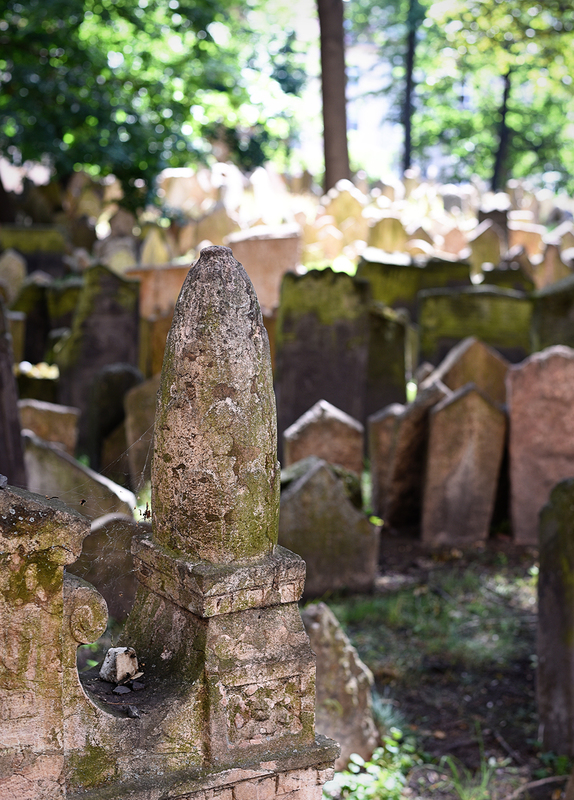 Jewish people were buried there from the mid-1400’s to the late 1700’s, during which time there was very little expansion of the burial grounds. To preserve older graves while allowing for new ones, people were buried on top of one another, up to 12 layers deep in some places. The ground is significantly higher than street level and the headstones are tremendously crowded. Seeing generations of parents, children, and friends all crammed into such a small space had me in tears. I hope I didn’t embarrass David too much with my crying, but it was all so heartbreaking and overwhelmingly sacred. Our visit there really set the tone for the rest of our Europe trip. I’m so glad we spent our Sabbath morning in such a reverent place. 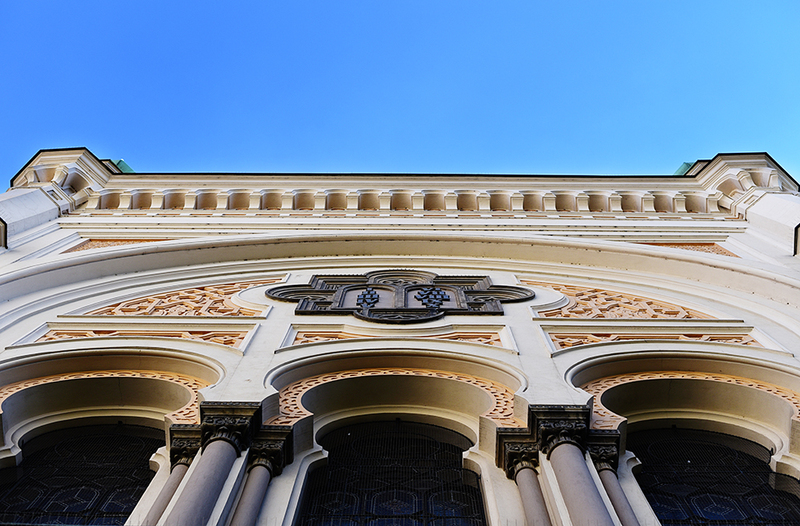 Travel Tip: Buy tickets to visit any of the sites in the Jewish Quarter at the Spanish Synagogue, as the line is much shorter there than at the cemetery or New Old Synagogue. 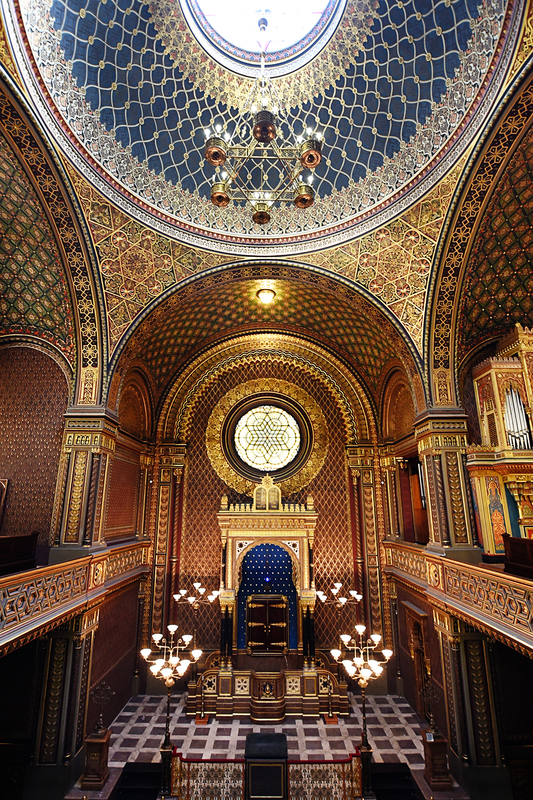 Locations: Spanish Synagogue is located HERE. Pinkas, the Holocaust Memorial, and the Old Jewish Cemetery are a short walk away, HERE. 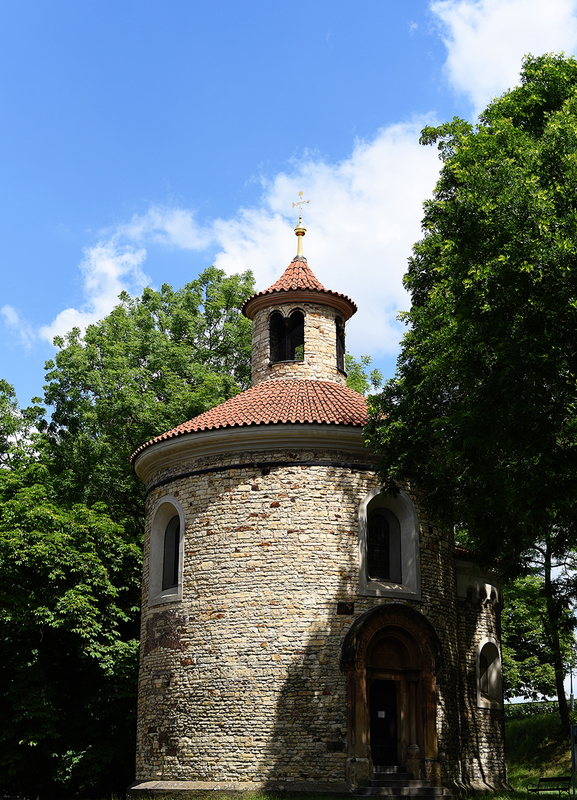 After our emotional visit to the Jewish Quarter, we headed to the Vysehrad: an ancient fortress on a hill overlooking the Vltava river. 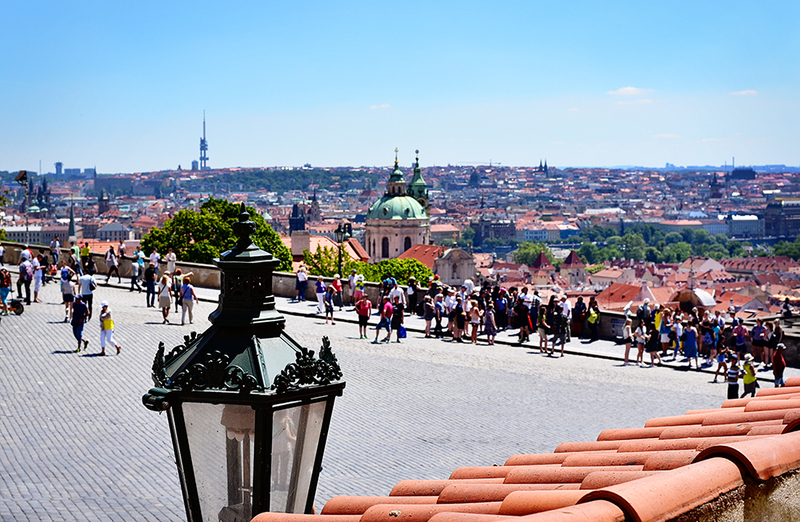 It’s less touristy than Prague Castle and just as fascinating, with an abundance of great views and fresh air. 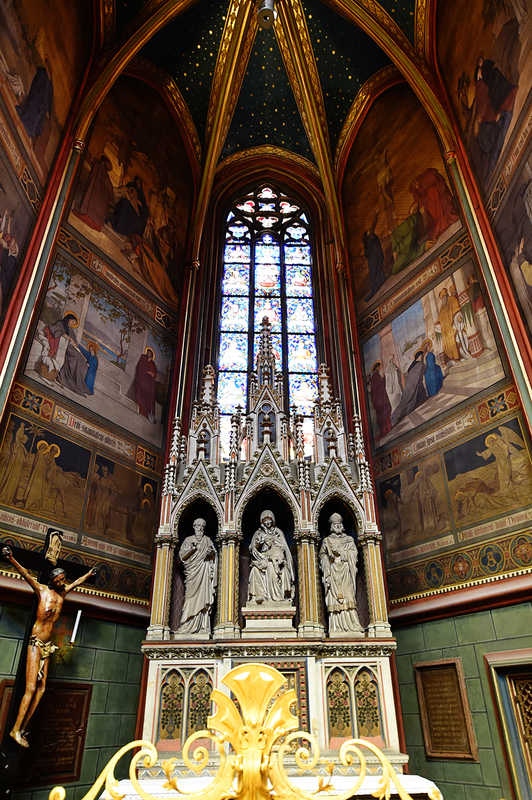 The fort was built over a thousand years ago and includes the beautiful Basilica of St. Peter + St. Paul, an extensive cemetery, several parks, and more. Travel Tip: There is a staircase that takes you basically from the street to the basilica, but it’s nigh impossible to find if you don’t know what you’re looking for. Shortly after the riverside tram goes through a tunnel, there is an apartment complex with a little “Vysehrad <—” sign by a dumpster in the parking lot. Get off the tram at the first stop past the tunnel and walk back till you find it. Trust me: it’s waaaaay easier than trying to find your way through back streets and people’s driveways up the hill. 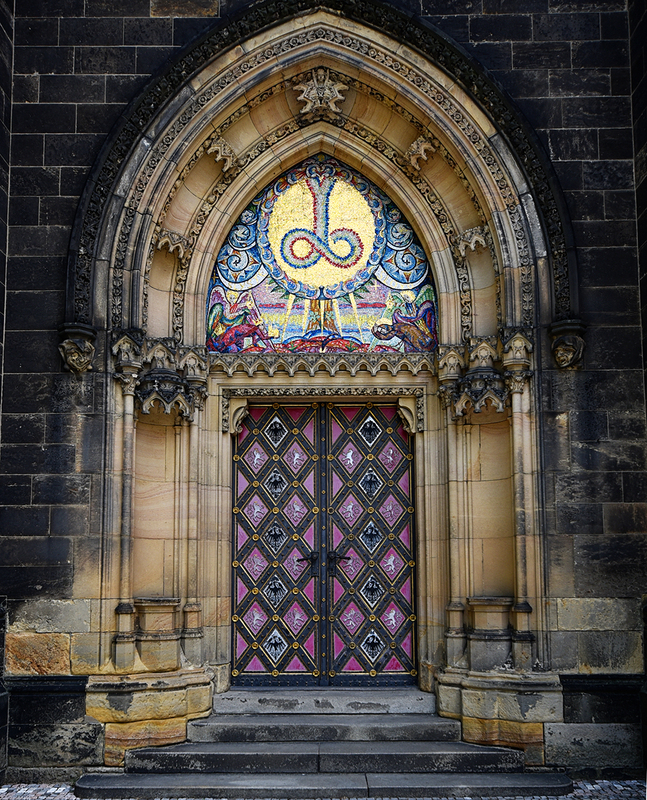 Location: The Vysehrad covers a lot of ground; the Basilica at the top of the hill is HERE. Trams 3, 7, 16, and 17 all stop at Výton, which is where guides say to get off. 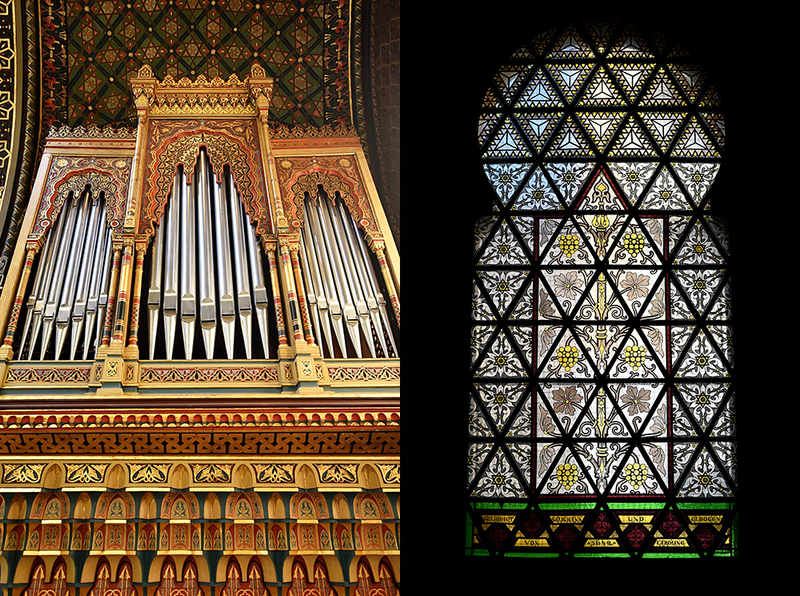 I’m pretty sure is the one closest to the stairs mentioned above is Podolská Vodárna, on lines 3 and 17. There’s also a Metro stop on line C at Vysehrad. When in doubt, head uphill. You’ll find it. Since we did end up going the “back” way, we ran into a little cafe that we probably wouldn’t have found otherwise. Each of us had a hot dog, some fries, and a drink for a quick, crazy cheap lunch. 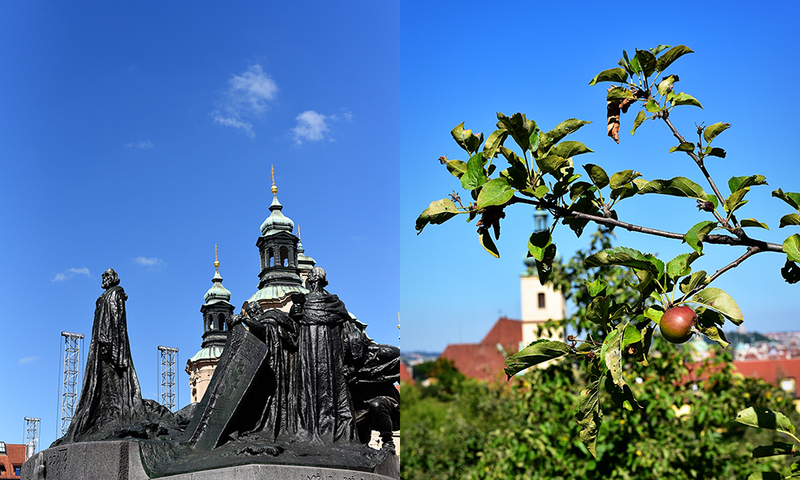 Then we took our happy bellies over to explore the basilica + cemetery and check out the fantastic views of the city. 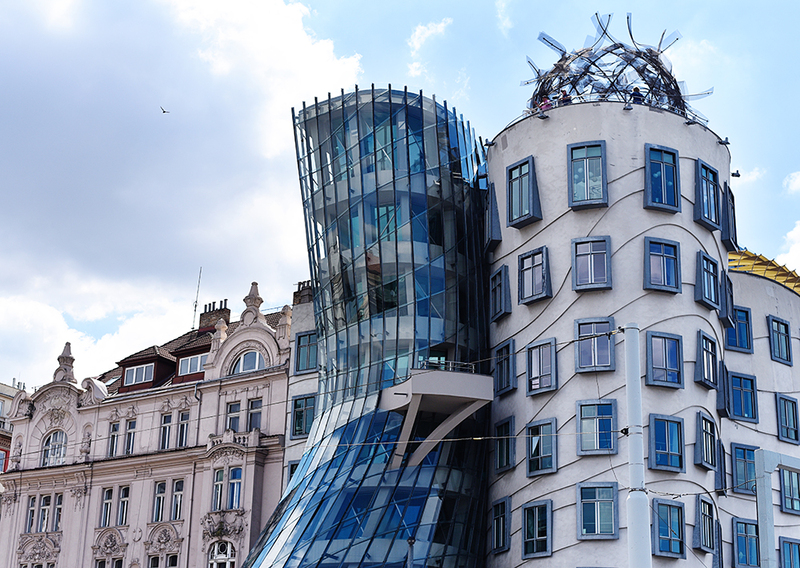 Travel Tip: On your way to or from Vysehrad, be sure to stop and see the Dancing House, designed by architect Frank Gehry. It’s right by the tram stop at the Jiráskuv bridge. Worn out from our mini hike up + down the Vysehrad hill, we were happy to jump back on the tram line and head to the famous Charles Bridge. HELLO TOURIST CENTRAL. There were buskers, street artists, beggars, tour groups, and more, all crowded between bigger-than-life-sized statues of saints lining the bridge. It was madness. I took no pictures, partly because I was overwhelmed and partly because I wasn’t quite comfortable pulling out my camera in that kind of crowd. 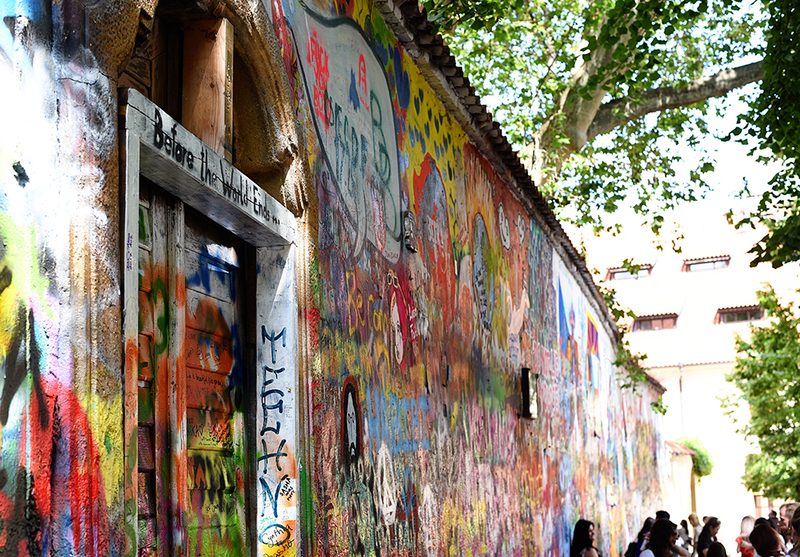 We crossed as quickly as we could to the other side of the river in search of the Lennon Wall…and we promptly got lost. I mean, we were able to hear some brilliant live music in a lovely little riverside park (Czech jazz is a thing and it’s worth hearing). We caught a glimpse of these super creepy baby sculptures outside the Museum Kampa. Eventually we stopped for some gelato because it was HOT and we were TIRED. Travel Tip: Duck down a side street to find a gelateria because everything is more expensive on the main thoroughfare. Finally we found a large group of Asian teenagers who led us directly to our destination. Again with the crowds. So overwhelming. Still, I’m glad we made a point of finding it. 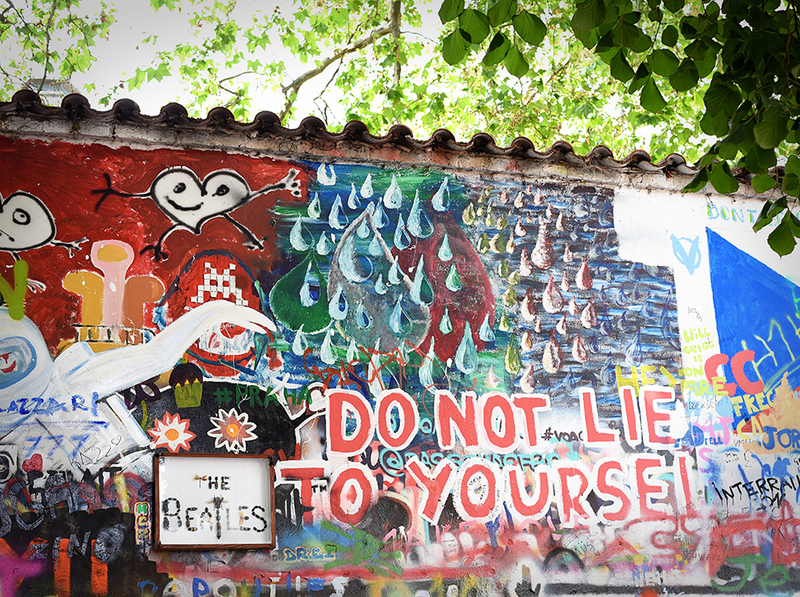 Location: The Lennon Wall is HERE. It’s easy to miss, since this part of town is a bit of a maze. Go just west of the Charles Bridge tower (on the west side of the river), and turn left. Follow the street around to the left, past what looks like a little church/monastery, and you should find it. We spent the rest of the afternoon making our way back to our hotel, where we found ourselves too jet-lagged and tired to even care about dinner. Day two began at the Strahov Monastery. At least, we tried to start there. We figured out the public transit we needed to use, but once we got off at our tram stop we felt completely lost again. Czech is confusing. After a little bit of wandering around, we found the monastery…only to discover the library—which is the one thing I wanted to see there—was closed until after lunch. Alas. 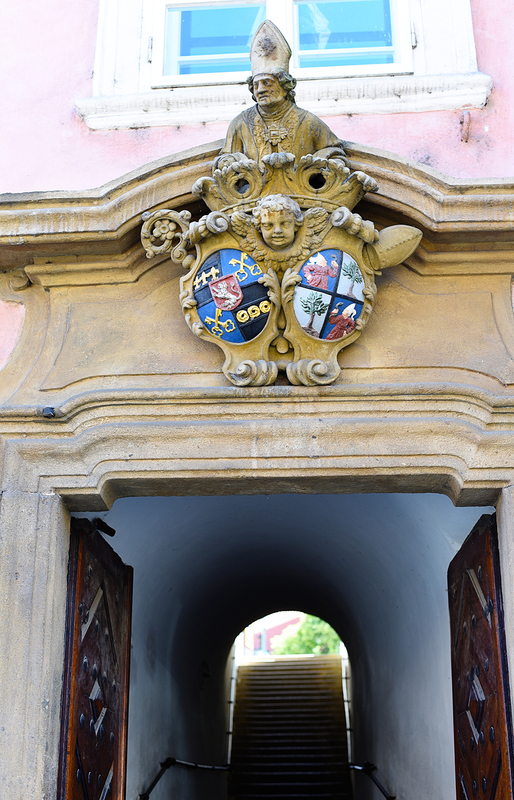 Rather than waiting an hour there, we walked down hill the short distance to the Prague Castle complex. And, conveniently enough, we arrived just in time to see the changing of the guard! There was a delightful brass band playing fanfares as the soldiers marched around in formation. Then they all marched uphill, right past us, and off to wherever they were going. Travel Tip: The changing of the guard at Prague Castle happens hourly, but the fanfare version we saw is daily at noon at the west entrance. Totally worth a watch! 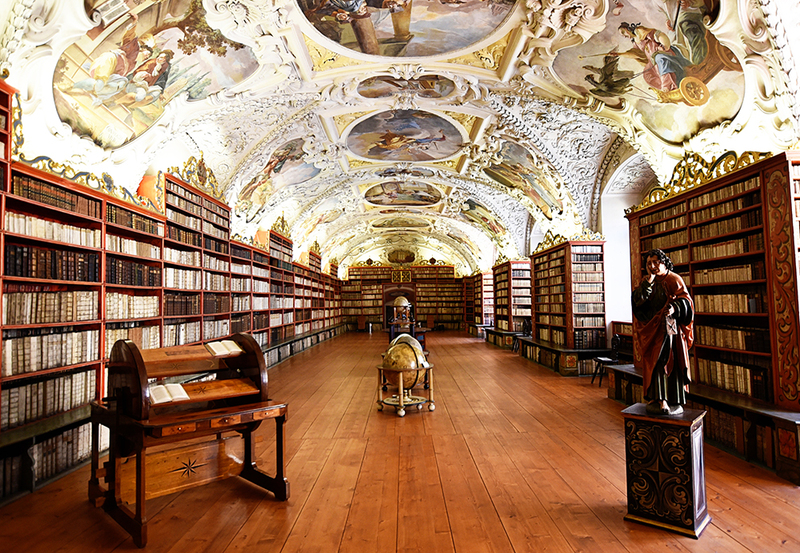 We made our way back up to Strahov to see the infamous library. It was stunning, but a little disappointing as it was smaller than I expected and we weren’t able to go in the gorgeous rooms. Travel Tip: There is a photography fee for the library. It’s not worth visiting if you aren’t going to take pictures, in my opinion. I suggest either all or nothing on this one. 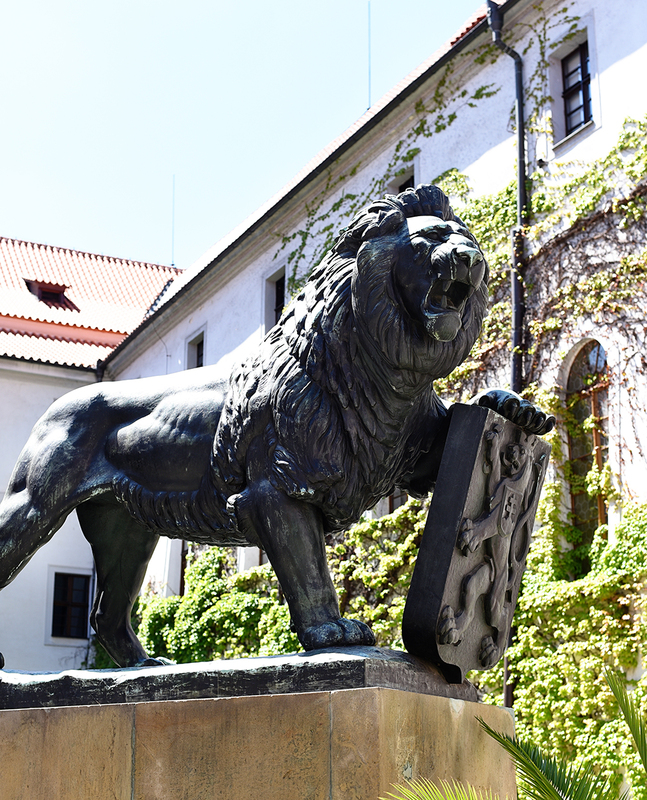 Location: Strahov Monastery is along tram line 22; get off at the Pohořelec. 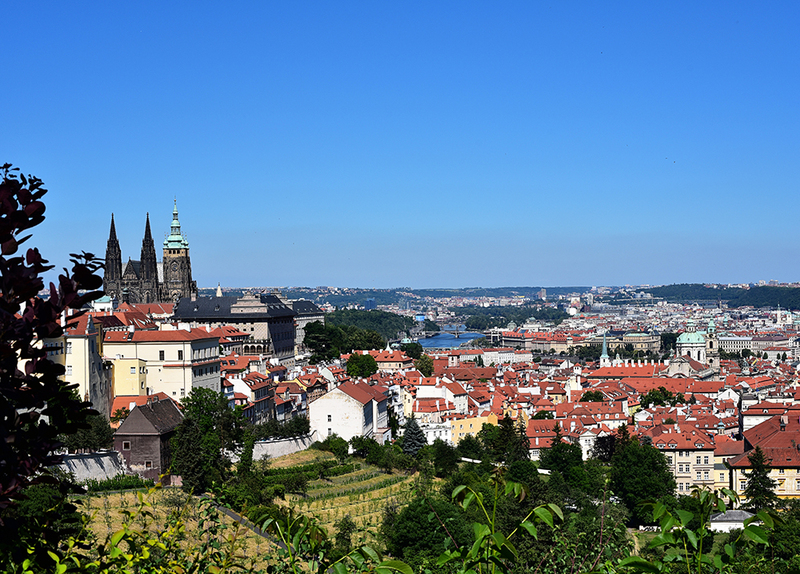 To get to Prague Castle from there, head downhill and east toward the river. 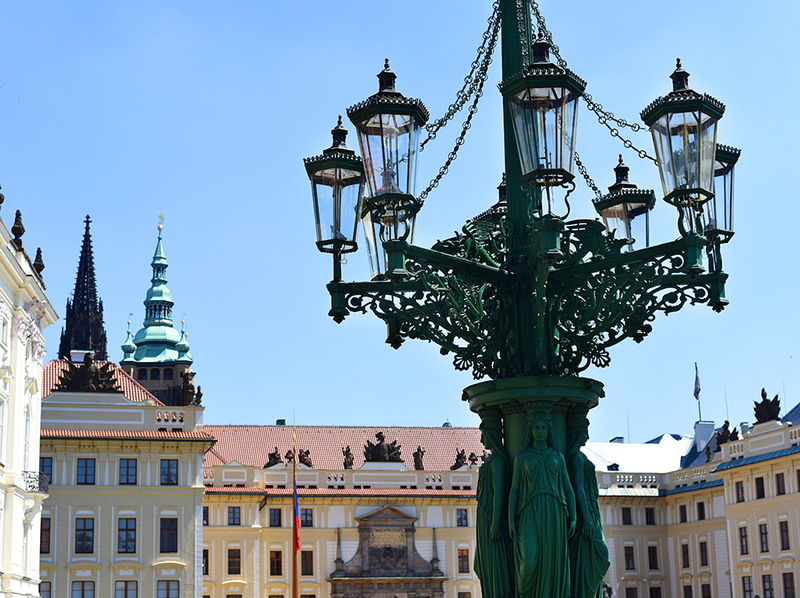 Once we finished our brief tour of Strahov’s library, we wandered back toward Prague Castle. Just above it, we found a darling restaurant with a patio overlooking the city, so we stopped for a late (looooong) lunch. The “homemade lemonade” was perfect, even if it was made from oranges instead of lemons. (Czech is confusing.) Everything on the menu looked delicious, and we couldn’t have found a lovelier spot to eat. Restaurant: Bellavista is located HERE. I’m so glad we ate before touring Prague Castle. The complex is huge and we only saw a fraction of it, but what we saw was pretty incredible. 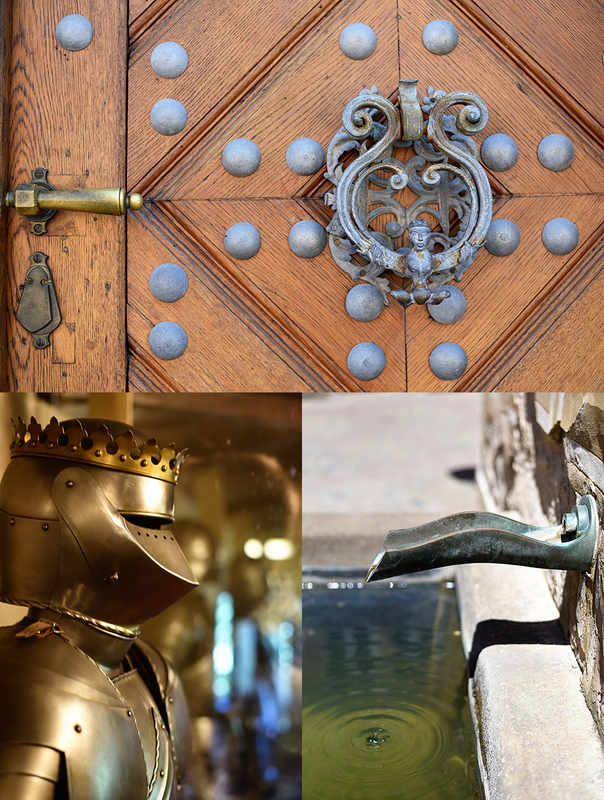 Travel Tip: Decide beforehand what buildings and sites you want to see. There are a few different ticket bundles to choose from, so make sure you get one that covers all your “must see” places without paying extra for those you aren’t interested in. 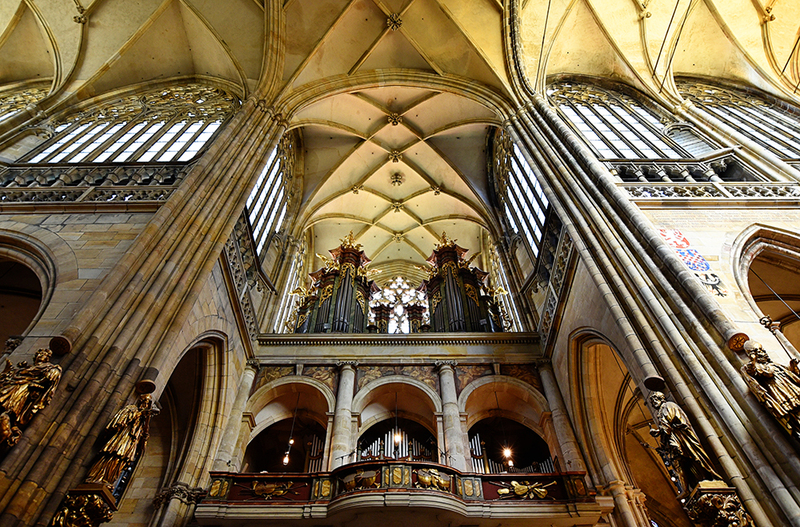 Ours covered St. Vitus Cathedral, St. George’s Basilica, the old royal palace, and “Golden Lane,” plus a photography permit. 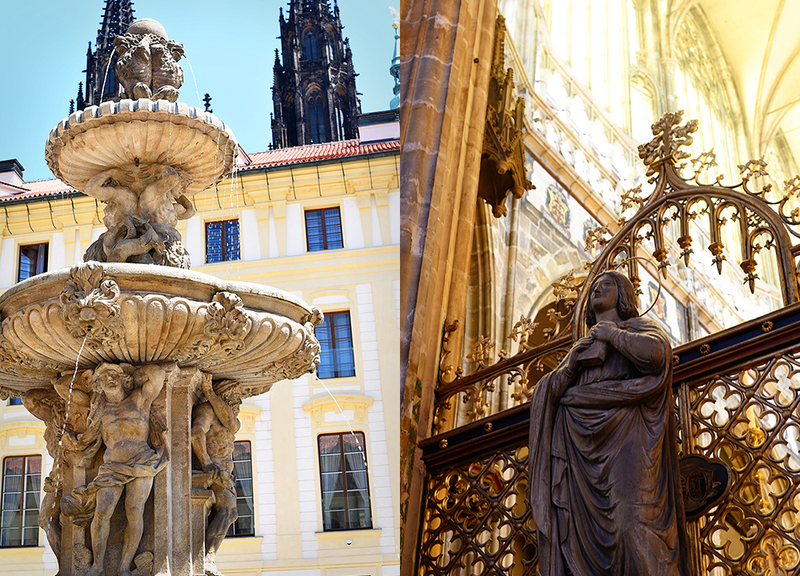 There just was SO MUCH to take in at Prague Castle, so I’ll let the photos do the talking. 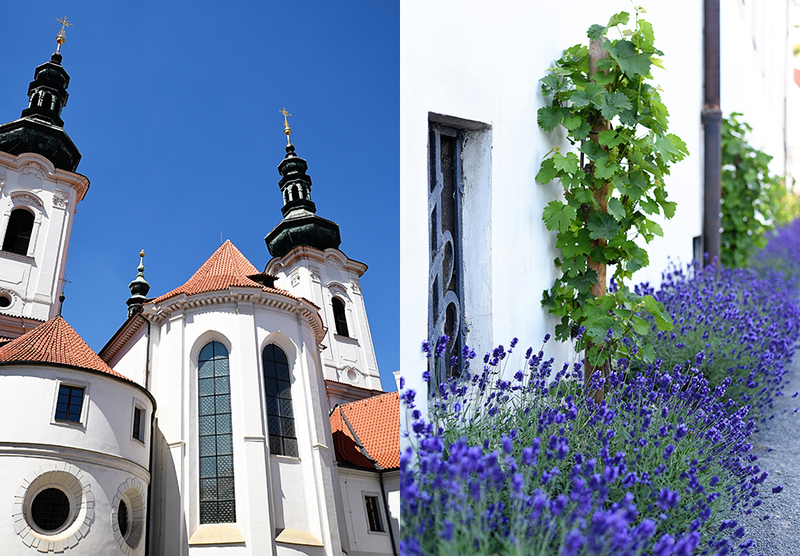 Instead of diving back into the hordes of people near the Charles Bridge, we went back out the Matthias gate, up toward the Bellavista, and picked our way slowly down through the vineyards + gardens between the castle complex and Petrin Hill. 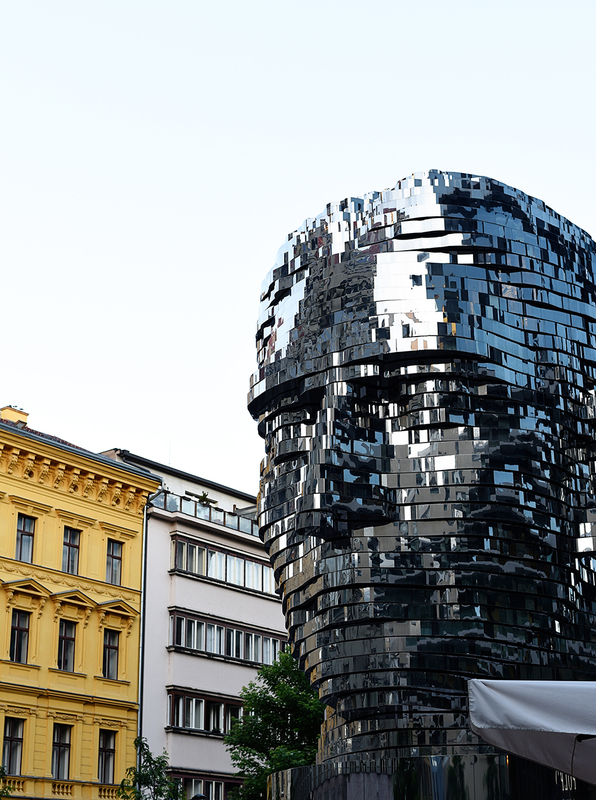 Then we went back across the river in search of one final quirky landmark: the mirrored Kafka head. We got turned around more than a few times in our attempt to find it, but I’m SO GLAD we did. I only wish we could’ve stayed to watch it shift. The layers rotate and change the entire piece so sometimes Kafka is sticking his tongue out! Since we didn’t know how long it would take before something happened or if it only worked during certain hours, we decided not to linger too long. 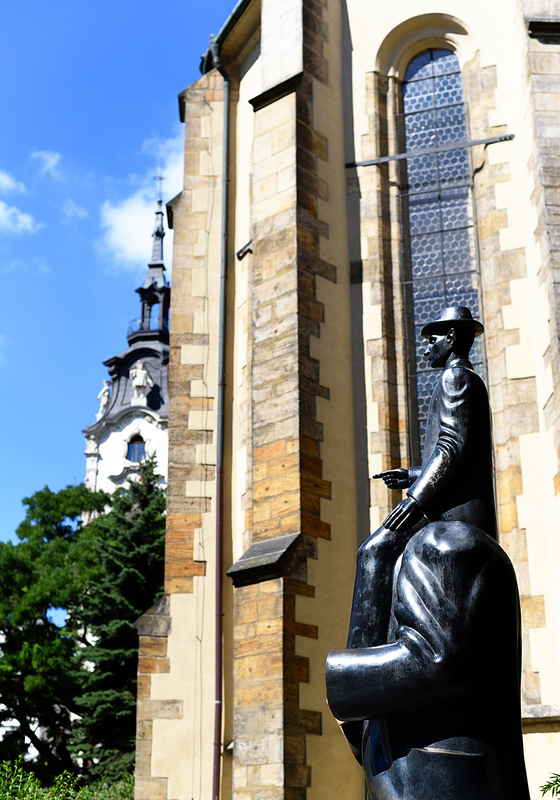 Location: The Franz Kafka Monument is HERE. Just down the street is Charles Square, and that whole part of Prague is filled with shopping, restaurants, and street performers. We found an Italian place (whose name I don’t remember), grabbed an empty table, and stuffed ourselves with delicious pasta. Travel Tip: When in doubt about what to eat, go for Italian. Pizza and pasta are always good. Everywhere. Amen. Travel Tip: Most restaurants in Czechia were the “seat yourself” kind. Waiters are not attentive the way they are in the US; they don’t seem to be assigned to any particular area of the restaurant but will take care of whoever and whatever whenever they’re needed. They work HARD. But you have to speak up if you need anything, because they won’t be checking in. Meals inevitably take longer than they do in the States. Try to enjoy not being rushed. Foreigners are expected to tip around 10%; we always gave more, especially when the food and atmosphere were excellent. 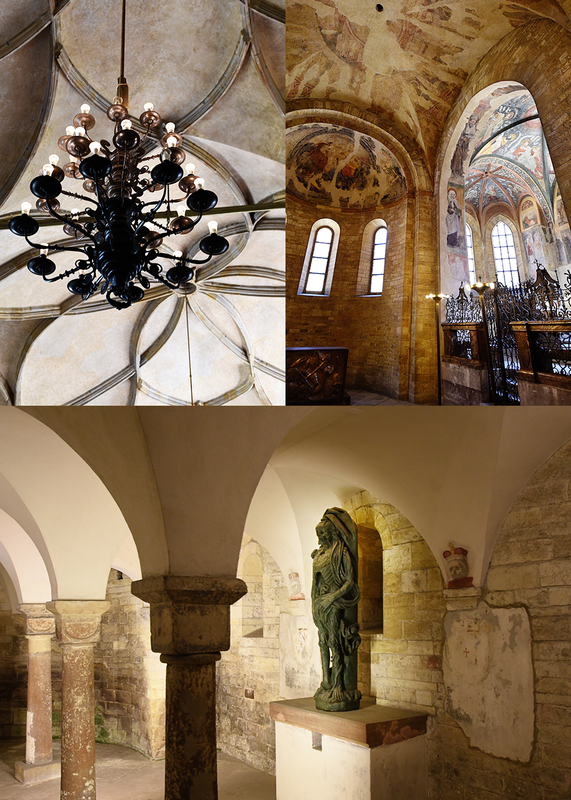 One of the things I loved most about Prague is that there’s something awesome around every corner. 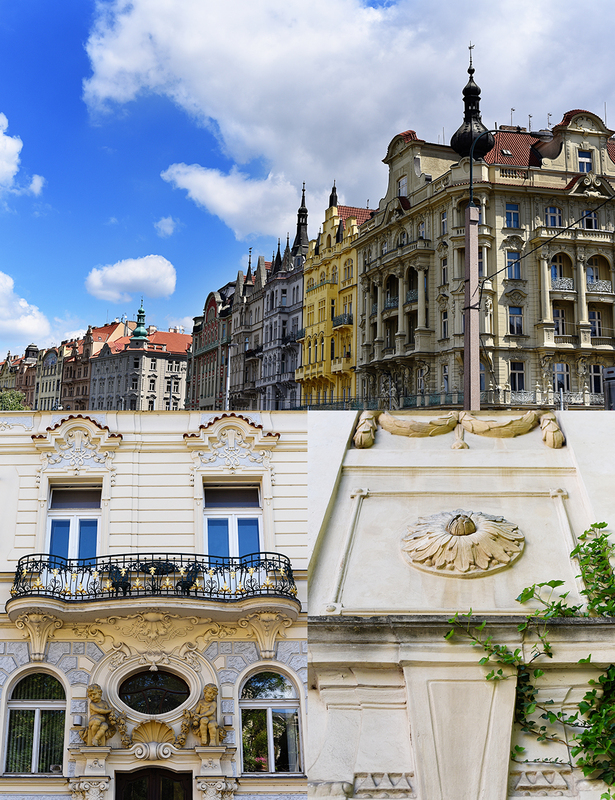 You don’t have to get up close to be delighted…but if you do, you’ll quickly realize that the Czech Republic is packed to the brim with beautiful details. There were so many museums and historical sites we could’ve visited if we’d had, oh, a month or two. What we did see in the 48 hours we had there, though, was incredible. I feel like we really hit the highlights and, if I had to do it again, there’s not much I’d change. By the time we boarded our train Tuesday morning for the Czech countryside, I felt completely satisfied with our adventures thus far. Coming soon: Brno and Vienna!